Hello friends! I hope you are doing well! I have been snowed under this week, but I finally got a card made today to share with you here. 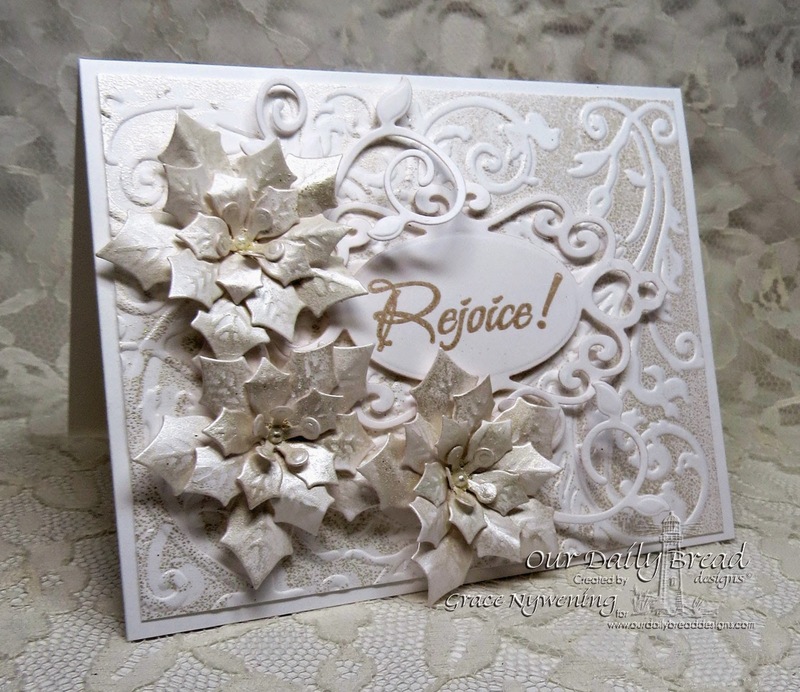 I used the newly released Peaceful Poinsettias from ODBD, as well as a past release, Worship the Lord. I cut and embossed three sets of the poinsettia dies from white card stock, sponged with Brilliance Platinum Planet Pigment ink, spritzed with water and then began shaping them with an embossing stylus on an embossing pad. I loved the shimmer of the platinum ink. I stamped the word Rejoice from the Worship the Lord set and embossed it with a soft goldis color of embossing powder, but there is no name on the bottle so I can't tell you what it is. I cut that panel with a Spellbinders Fancy Tags 2 die from white cs. For my base panel, I used a T Holtz embossing folder (Sizzix) and rubbed the negative side of the folder with the same Brilliance ink, then ran it through my grand calibur. I love this effect! I mounted that on a white base, arranged my poinsettias, added some white flourishes from the Fancy Foliage Die set, and some tiny pearls. I am entering this in the current Shining the Light Challenge over on the ODBD Blog. It's anything goes with ODBD stamps! Hope you can play along! That's it for me today. I'm sorry I'm a little busy at the moment, but I'll do my best to keep some samples coming for you! The prayer of a righteous man is powerful and effective! Oh Grace this is just beautiful....I love the shimmer and your poinsettias are gorgeous! Grace, this is just gorgeous. I love that shimmery paper and the embossing folder you used. Thanks for the sweet comment you left on my card. OH Grace, this is stunning! I love the shimmer paper you used for this. I want this die now that I have seen how beautiful it is! Oh, Grace, this is gorgeous! I love the soft, glimmery color and wonderful texture! And your poinsettias are so beautiful! I really love how you've so delicately shaped them! Really exquisite card!! So glad you got to play and support the Shining the Light challenge! We always so appreciate the other breadsticks playing along with us!! Hugs, dear friend! Absolutely gorgeous and serene Grace, so beautiful. Wow Grace. Magnificent choice of paper. Those flowers just pop with the shimmer and texture. Lovely. Thank you for the encouragement you give from the Word of God! Always a blessing in addition to your beautiful cards! Thanks!! Oh Grace those flowers look stunning. Your card is beautiful. I love white Christmas cards!!! Hugs. Where to begin!!! This is absolutely stunning my friend!! I so love the layout and all the white poinsettias. Sheer elegance!! The subtle inking is the perfect touch!! GORGEOUS my friend!! Thanks for sharing and supporting the challenge!! You know I so appreciate you!! Stunning! The shimmery white is just gorgeous! Such a beautiful design! Oh Grace this is fabulous - love how you have used the platinum ink - you have inspired me to look at mine in a new light. This is so elegant, love the white and all the lovely textures and oh so pretty details !!! This card is definitely elegant! Love the inking of the folder. The platinum sets off the design. Great job.